Surprisingly little is known of Broaten, a designer/builder from Mason City. 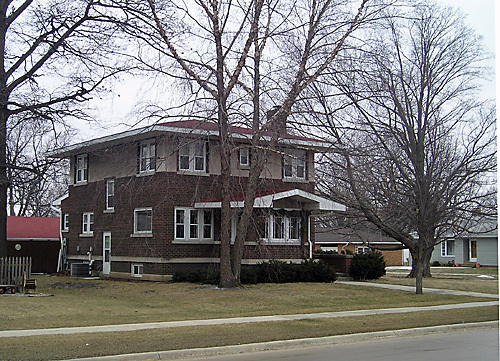 His houses often combine Prairie School elements with prevailing Foursquare forms. A more ambitious house from Broaten’s hand is two blocks west at 105 Second Street SE. • Gebhard, David, and Mansheim, Gerald: Buildings of Iowa. Oxford: Oxford University Press, 1993, p. 399. • Wilson, Richard Guy, and Robinson, Sidney K. The Prairie School in Iowa. Ames, Iowa: The Iowa State University Press, 1977, p. 73.